Capacity: 16,000 (1931); 18,500 (1946); 22,900 (1958). Viewpoint Tickets - Best prices on Giants tickets, Baseball tickets and MLB All Star tickets. Location: At the corner of 16th & Bryant Streets. Right field (S), 16th Street; first base (W), Bryant; third base (N), Alameda Street; left field (E), Potrero Avenue. Dimensions: Left field: 340 ft. (1931), 365 (1958), 361 ft. (1959); left-center: 375 ft. (1958), 364 ft. (1959); just left of dead center: 404 ft. (1958); center field: 400 ft. (1931), 410 ft. (1958), 400 ft. (1959); just right of dead center in the corner: 415 ft. (1958); just fight of the 415 mark where the seats jutted out: 397 ft. (1958); right field: 385 ft. (1931), 365 ft. (1940), 355 (1958), 350 ft. (1959); backstop: 55.42 ft. Fences: Left field: 15 ft. (5 ft. concrete below 10 ft. wire); center field scoreboard: 30.5 ft.; right field: 16 ft. (5 ft. concrete below 11 ft. wire). Seals Stadium was built in 1931 for the Seals and Missions of the Pacific Coast League. The Seals became the stadium's sole tenant in 1938, when the Missons moved to Hollywood and became the Stars. 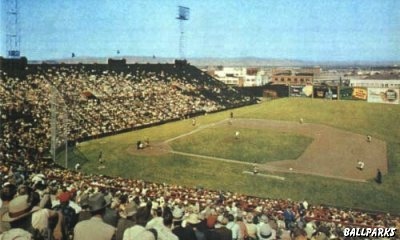 The Seals continued to play here until the Giants relocated to San Francisco from the Polo Grounds in New York in 1958. The Giants played in Seals Stadium for two seasons until they moved into Candlestick Park in 1960. Rumor has it that in the 24-hour Safeway store located above Seals Stadium in San Francisco, the employees occasionally see the ghosts of former Seals players walking down the aisles late at night. The fold down reserve seating and the light stanchions from Seals Stadium were sold for use at Cheney Stadium in Tacoma, Washington. The seats remained in use until 2005 when they were sold for $75 apiece and replaced. Inaugural Season: The San Francisco Giants and their First Season at Pacific Bell Park by Rob Dell'Ergo. Splash Hit! Pac Bell Park and the San Francisco Giants by Joan Walsh, C. W. Nevius, Larry Baer and Peter Magowan. View inside Seals Stadium courtesy of the Franklin Digital Collection. Aerial view of Seals Stadium courtesy of the San Francisco Giants. View of the shopping center courtesy of Thomas Rex Hardy. Specials thanks to Lanny Moore and Betsie Doust. Tickets to MLB All Star game, NCAA Basketball Tournament, College Football Bowl, NCAA Football, Oakland Athletics, Paul McCartney and San Francisco Giants provided by Ticket Triangle.